The Greater flamingo (Phoenicopterus roseus Pallas, 1811) belongs to the order of the Phoenicopteriformes and to the family of the Phoenicopteridae and is the greatest among the members of this family and the only species nidifying in Europe. It is a typical bird of tropical areas and its appearance in our skies is since ever seen as a projection on the European territory of exotic beauties. To observe them leads us to dream and imagine far away lands. Among all flamingoes, the greater flamingo is perhaps the species having the least bright colours so much to result completely white when on the ground and shows the typical colour from which it takes the scientific name, only when flying. The most closely related species and with which it shares most of its range, is the Lesser flamingo (Phoeniconaias minor) that, actually, is one of the most coloured even if placed at the rank of smaller and without any reference to its splendid colour in the scientific classification of the species. The greater flamingo is known in Europe since the time of the old Romans, when it was kept in captivity due to its particular features, to its elegance and the colour but even more due to its tongue which was considered as a choice culinary delicacy. The particular tameness this bird shows when captive, renders it suitable for living in whatever zoo or nature park even though with time tends to lose much of the colour characterizing it when in the natural state. The huge quantity of beta carotene it assumes though the highly specialized alimentation, is the essential base for keeping its natural colouration as, missing it, it is hopelessly bound to lose its magnificent hues. When captive, this deficiency is partially compensated by artificially coloured aliments. 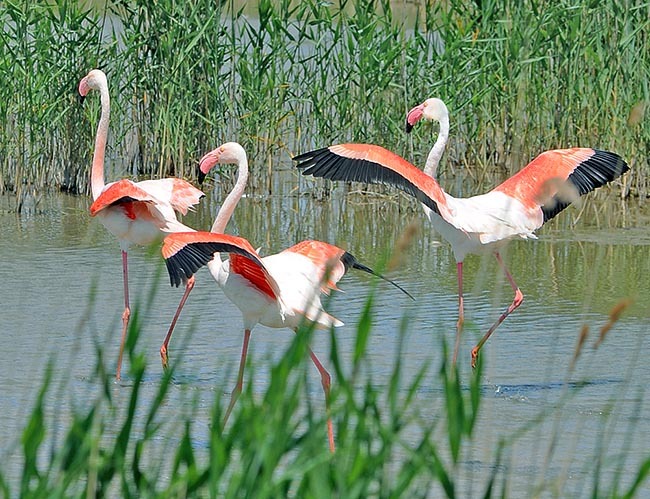 The flamingoes nourish of micro-organisms and algae living in highly saline and alkaline waters, habitats difficult to reconstruct inside artificial structures. They are also birds very resistant to the temperature variations as well as extremely long-lived, so much that a few years ago a glorious record was beaten by a specimen who lived in the Adelaide, Australia, zoo for 83 years. 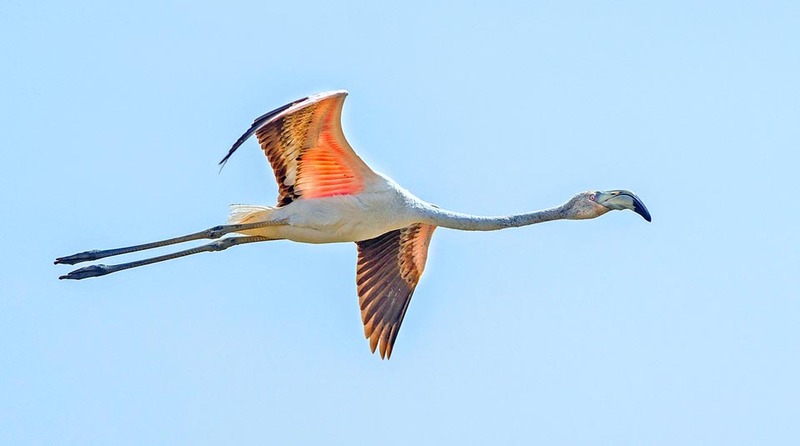 The etymology of the genus Phoenicopterus gets its origin from the Greek “phoinix” = red, carmine and “pteron” = wing and the name of the species from the Latin “roseus” = pink, due to its colouration. Some vulgar names given in Europe: in English, Greater flamingo; in German Rosaflamingo; in Spanish, Flamenco comun; in French, Flamant rose, in Italian, Fenicottero rosa or maggiore and in Portuguese Flamingo-comun. 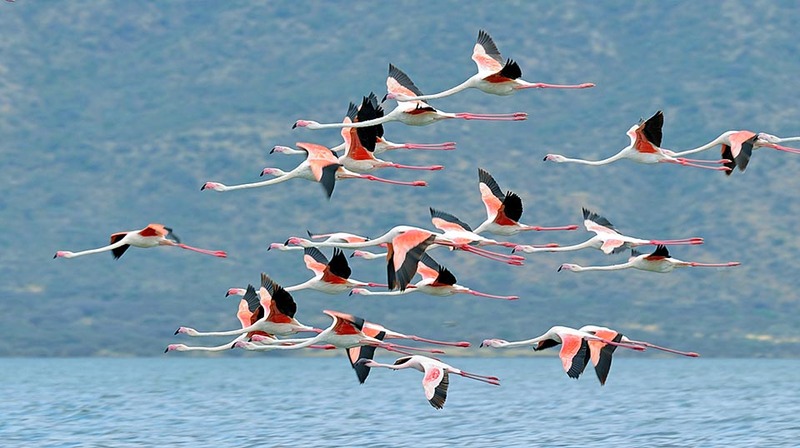 The greater flamingo lives in Africa, Asia, and in some areas of the Mediterranean Europe. Typical of brackish lagoons and of alkaline lakes, it is found in all austral Africa where these habitats are present and in Asia in the marshes of the Rann of Kutch of Indian Gujarat and in Pakistan. In Europe, it is found in isolated colonies in France at the delta of the Rhône River in Camargue, in Spain, in the Reserve of Coto Doñana at the delta of Guadalquivir and in other coastal lagoons, in Portugal, in Cyprus and in Greece. In Italy is present in the wetlands of Comacchio, in the Po River delta, in Puglia, Tuscany, Venetia, Sicily and in Sardinia where is located the most important Italian nidifying colony. Mainly migrant in the European territories, in Africa it is typically resident even if regular internal migrant between the various lakes of the Great Rift Valley. Remarkable are its presences on the lakes Bogoria, Nakuru, Etosha Pan, Magadi and Natron but is often present along the Atlantic coastal salt marshes such as at Walvis Bay in Namibia and northward up to Mauritania and Senegal. It is present, isolated, on the Lake Chad. The Asian populations are almost resident. All the members of the family of the flamingoes depend strictly from the particular alimentation and the places where such food is present. The presence of this bird is therefore linked to the brackish water ponds, the lakes with alkaline waters, the coastal swamps open to the income of the marine water, the decantation tanks for the extraction of the sea salt. 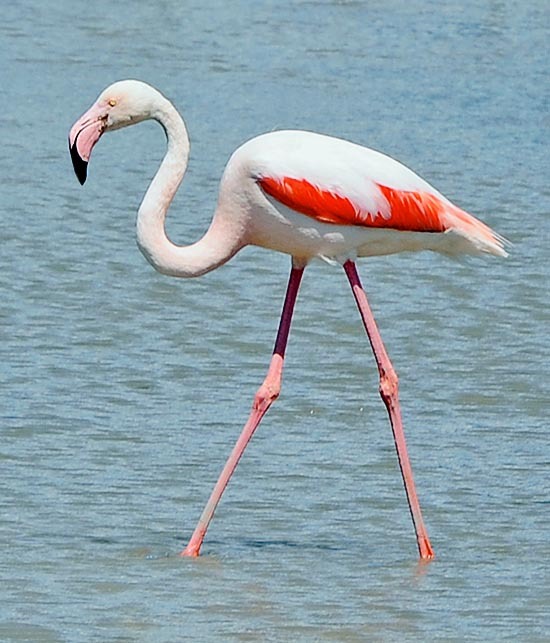 The dimensions of this flamingo are remarkable and this facilitates its recognition when present, mixed with other species, inside the immense African flocks. It has a length of 100 cm that reaches the 150 cm if we include the very long legs. It has a weight varying from 2 to 4 kg and a wingspan of 150 cm. Like all flamingoes its shape is somewhat strange and even more surprises how it may remain suspended in air when flying. A very long and slender neck that occupies half of its total length and that when resting is often kept coiled around itself in order to be able to support the very strange and enormous beak betwen the feathers of the back. When flying, it is instead kept stretched forward and the beak boldly jutting forward. As it happens for the Phoeniconaias minor this unusual beak, at first indecipherable, serves to filtre thousands of litres of water per day. A natural pump that aspires and in the meantime pumps out with a very fast and continuous movement of the squat and round tongue, that practically works as a tireless piston of a hydraulic pump, holding between the extremely narrow laminae surrounding the edge of the beak, the microscopic algae and the small crustaceans that form their diet. 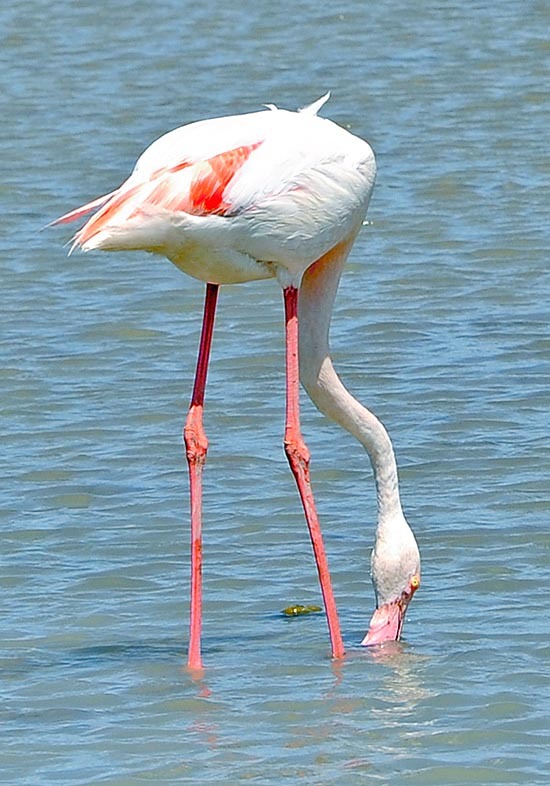 The legs have practically the same length as the neck, so much that when feeding dipping the beak into the water, does it while standing without the slightest hint of a bow. The body is stocky and when flying is kept over the line formed by neck and legs that, instead, result respectively dropping forward and backward as if they were too heavy and long for their size. The basic colour of the greater flamingo is the white and only the alar coverts show the pink colour that has given it the scientific and vulgar name. The remiges are black and like the pink coverts, can be seen only when the bird is flying. When resting, appear only some reddish feathers that match with the long legs and the beak, both of the same colour. Also the eyes are bright pink. The beak is massive and curved at half of its length, of 90° downwards, rightly for the necessities described before. The tip of the beak is black. The toes are webbed. There is no evident sexual dimorphism if not for a slight and minor size of the female. The Phoenicopterus roseus nouri- shes of microscopic crustaceans such as the Artemia salina and particular brackish water organisms like those belonging to the genera Chironomus, Arthrospira, Navicula, Lyngbya and Oscillatoria. Infinitesimally small beings, practically invisible to the human eye that render necessary an accurate operation of filtration to be intercepted and assumed. Like all flamingoes the seizing of these microorganisms occurs keeping the beak upside down with the upper mandible immersed under the surface of the water and the lower just out. 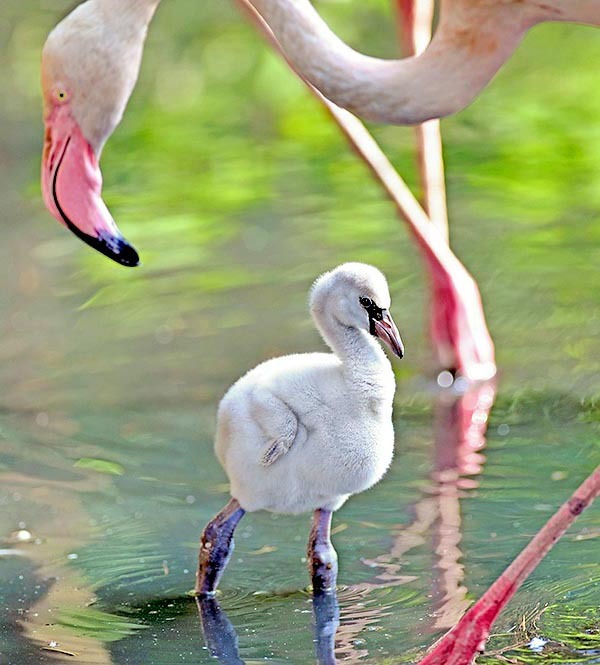 The greater flamingo is monogamous and forms stable couples only during the nidification period. The nest is built by both partners piling mud mixed with algae and vegetables till when a small truncated cone takes form sufficient for maintaining dry the only egg from possible and unexpected rises of the water level. The nests are placed at so close distances not exceeding at times the 50 cm from each other. The brooding is alternated between the sexes. It nidifies in huge colonies thanks which it creates a defense line against the numerous predators though little can be done when it is matter of eagles, big strigids, marabous (Leptoptilos crumenifer) and also hyenas and jackals. The egg hatches after about 30 days and the chicks when just born are covered by a greyish down they will keep till the growth of the first livery. The maturity happens after the third year even if the first reproduction may take place even after several years. It is interesting to understand how the parents can manage to locate inside a nursery of hundreds od thousands of chicks their own son. An immense greyish lot, continuously in rapid movement, in an infernal uproar accompanied by an incredible turmoil. The greater flamingoes are able to fly away only after about 90 days from their birth. As previously said, the flamingoes are long-lived also in the wild, consequently it is not considered as an endangered species. It is amply protected all over the European continent.